How often do you get to hang out with others who share your passion for photography, visit interesting places, learn new techniques, and enjoy good food all along the way? Probably not often enough. We can help you with that. The 2018 TDS Workshop Season is ready for your review. And we think you're going to like what you see. 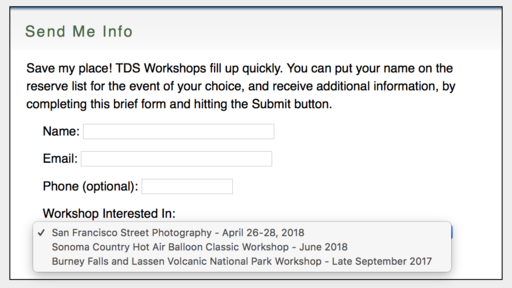 By getting on the reserve list via the TDS Workshops page, you can save your place at the front of the line. Those on the reserve list have the opportunity (but not the obligation) to secure a seat for the event of their choice. Using the Send Me Info form on the workshops page, simply choose the workshop you're interested in from the popup menu, then enter your name and email. Click on the Submit button. That's all there is to it. I'll send you a confirmation letter to let you know you're on the list. 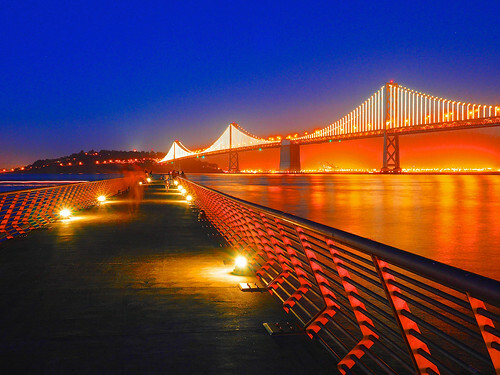 At that time, you can respond with any questions you have about the event of your choice. Reservation forms with itineraries typically go out 90-120 days before the event. At that point you can sign up for the workshop and pay the course fees. We specialize in personal service. So we're here to answer any questions you have. Use the Send Me Info form to get the ball rolling. Hope to work with you in 2018!